We seek to bring exceptional value through a pioneering approach to integrated, forward-looking financial management. Your vision, planning and hard work have brought you to where you are today. We can help amplify that success. By combining tax experts, accounting professionals, wealth specialists and business consultants into a single interdisciplinary team, we can maximize the value of your business and investments today and protect your legacy for generations to come. We know the importance of your entrepreneurial ventures and the efforts required. For almost three decades, we have worked with people to cultivate their ideas while focusing diligently on their execution to create lasting success. To support our clients' ever-evolving needs, we offer consulting, wealth management and family office capabilities to complement our expert accounting and tax advisory services. Our big-picture approach focuses on the future. You have a vision for your business and personal legacy. We believe tax planning, accounting, and financial management should be used as dynamic, active catalysts in enabling you to attain your goals. We work tirelessly to create value. The meaning of value has multiple interpretations. Whether simply increasing the bottom line, growing or selling a business, or protecting your wealth through portfolio management, we will become your trusted partners who deliver grounded, strategic thinking. Help us learn more about the answers you are looking for. What areas of your business and personal success are of highest priority? Our “why” drives us every day to search out ways to help pave your path to more success. Day-to-day management and strategic guidance for families and their advisors. We built a long-term partnership with a client by first addressing their tax and accounting needs, and then further deepening our relationship as the client's business and personal wealth grew. After playing a pivotal role in the successful sale of their business, we continue to manage their family office. 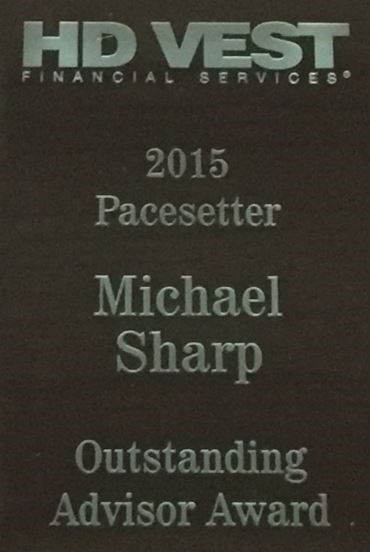 CONGRATULATIONS MICHAEL H. SHARP AND THE SHARP FINANCIAL GROUP! The Pacesetter Award program is designed to recognize advisors for their commitment to providing clients with investment services and strategies that will help them work toward a brighter financial future. Michael Sharp and The Sharp Financial Group accept this award on behalf of our clients and thank them for their partnership. 2015 MONEY MANAGER AWARD WINNER! The Award honors excellence in Wealth Management - Winners were announced during a ceremony on October 8th. The Five Star Wealth Manager Award program has been recognizing and promoting outstanding wealth managers for over 10 years. The Five Star designation assists consumers in selecting a service professional that other consumers have indicated provides exceptional client satisfaction and service. The Sharp Financial Group shares this distinction with our team and thanks our clients, vendors and business partners for this admiration. 2015 Cornerstone Awards Finalist honoring impactful businesses in the community. Congratulations to all the winners! 2014 SmartCEO POWER PLAYERS AWARD WINNER!